So under your postbit (the section to the right with your name, avatar, and yadda ya), there's those two lines that say 'Profile Link' and 'Log Link', right above the one that says 'Linked Accounts' if you have an alt character or hub account. When properly formatted, these will point to the relevant threads. How does one go about formatting these fields properly? I'm glad you asked. Let Colonel Adam walk you through it. On just about any page — in this particular example, the main page of the Omniverse — you'll find a few links up in the top left of the page. Right under the Welcome back message, which is itself located under the bar of links under the Omniverse banner. All kinds of information there. 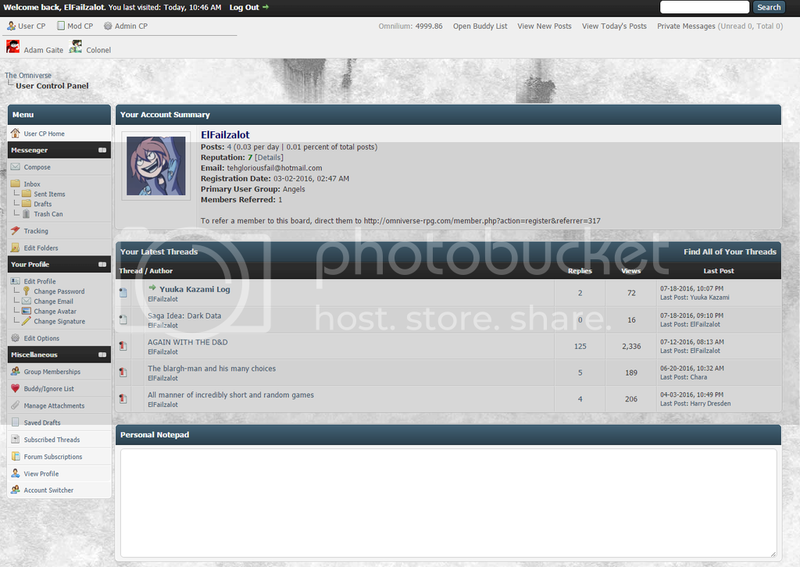 A basic overlook of your activity on the forum, and a bunch of other options. But for our purposes, namely, setting up your postbit, there's one thing in particular you need. 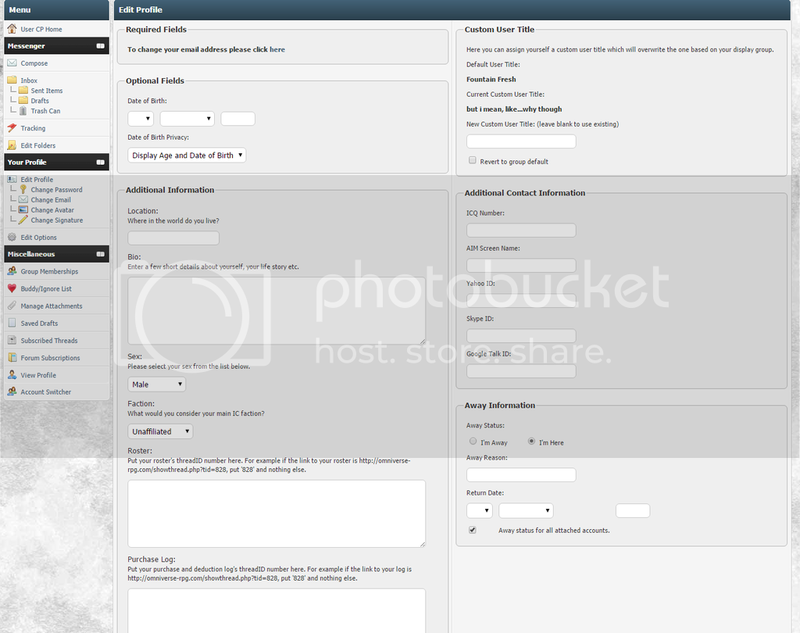 In the Menu section of your User CP, off to the left of the page, there's a bunch of options. The one we need here is 'Edit Profile'. It lets you do exactly what it says on the tin, and edit details of your profile, most of which show up, as it so happens, in the postbit/mini-profile next to your posts. Let's get to getting, and see what needs to be edited to get this under control. As you can see, they're mostly self-explanatory. You navigate to the thread you need to link to, and post just the the thread ID — that is, the number at the very end of the link, or directly after the 'tid=' part of the link, if you've navigated to a specific post or some such. Notice how in that link, the tid=1457 is the last part and makes it easy to grab. In this instance, I would just post the number 1457 in the text field for Roster. HOWEVER. If I, say, navigated to that by another means, such as a link like this one: http://omniverse-rpg.com/showthread.php?...5#pid30115 which, incidentally, links directly to the third post in Adam’s Roster, his list of stats and moves and the like, things get different. 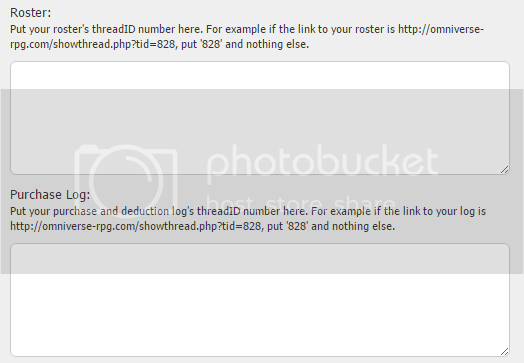 Notice how the link now ends in in ‘pid30115’, which is the specific post ID. And it’s listed twice, AND comes after the tid=1457 part that we need. Easy enough to spot, but be careful about such things. Once again, grab the part after the tid, in this instance 1038, and paste it into the text field in your user cp where it says Purchase Log. And that’s all there is to it, folks. No excuse for not having it all set up properly, with it being so simple!